"With a keen eye for details, only one truth prevails!" Liberating a brand new volume from the ongoing Case Closed/Detective Conan series from its cardboard packaging, before even glancing at the other mail, is, for me, an experience similar as to when I used to make a traditional grab for the latest Appie Baantjer novel from the shelves of one of the local bookstores – usually on the day the book came out. Yeah, yeah. There was a period in my life when a normal bookstore had everything in stock to keep me complacent, as opposed to now, when I prefer to take out a digital shop cart instead. Anyway, I guess I love this series because it has replaced Baantjer as a fixed habit and the pages of each new collection is like an unbrowsed meadow folding out in front of me like a playing board, dotted with places named Coffee Poirot, Restaurant Colombo and Books Baker Street, on which a kid-sized game piece moves around like a dark horse – translating dying messages, deciphering codes and unlocking sealed rooms. The clues are many and suspect abound! (note: I penned this review in a hurry and traces of sloppiness are bound to turn up. Please be so kind as to ignore them until they go away). A fiend referred to as "The Slasher" rips through the opening of the 43rd volume of this series, but the police looses the knife-wielding madman in a crowd of people, however, he has left them a tangible clue: a strange and bloody imprint of a symbol that turns out to be the logo of a car. Everyone in the vicinity driving such a car is brought in and Conan observes, behind the protective reflection of a one-way looking glass, how one of them slips up. It's not one of the best stories, weakly motivated and you have to accept the premise that all of the suspects lost the master key of their car, but it's another fine example of Aoyama taking full advantage of the visual element of his stories and hides clues in characters behavior, sticks them on their clothes or scatters them across their rooms. This dovetailing of clues, plot-threads and red herrings is very satisfying and a particular good example can be found in the main story of this collection. But first we drop by Coffee Poirot, where we find Richard Moore, known around the world as the famous "Sleeping Moore," taking his morning coffee and Aoyama must have been in an unusual whimsical mood when he wrote this story. Aoyama is not a dark writer in any sense of the word, usually giving his stories a light-hearted touch in the end (if they are dark to begin with), but seldom genuinely funny. Well, he got a smile out of me with the opening lines of this story – narrated by Moore himself. "I'm Richard Moore... Private Eye. Missing persons and cheating spouses are my bread and butter, but every now and them I get tangled up in something a little bloodier. Crimes of revenge, money, passion. This is one sick world I live in. And when ever the rough life of a detective starts to wear me down... I come to Poirot. A cup of Joe soothes my wounded soul and... YEOWW!" That last part is not a typo. Moore burned himself when he took a swig from his scolding hot coffee. Fortunately, the waitress hands him a case that rapidly develops into one of the biggest of his careers: a customer has left a phone and Moore has to tack him down. Routine stuff. A list of numbers on the phone complicated the case and turns into a deduction story in which Conan has to deduce the suspect from a small group of people and one of the clues, or "indicators," as they are apparently called in contemporary crime fiction, is almost as endearing as the opening scene of this story. The third story is the main course of this volume and opens with Conan picking up a detective novel from a bookstore, Kaori Shinmei's The Wicked Will, a reference going all the way back to the 19th installment, and plans to greedily read his way to the solution. Sounds familiar? Than you might guess what happens next: back home he finds two of his friends, Kazuha and Harley, on his doorstep who want to drag him (and Rachel and Richard Moore) off to Osaka for some fun – except they disagree on where to go. So what easier way to decide than a duel in deduction? Yes. Flipping a coin would suffice, but where's the fun in that? The problem they tackle is that of the unsolved murder of a toy manufacturer, who was tied-up in his office before being murdered, but was able to leave a cryptic message spelled out in ink-smeared blocks of wood. I have to admit that deciphering the dying message is a Herculean task for Western readers, but the (visual) clues that were strewn all over the place compensated for this. You don't have to understand Japanese to figure what about scene of the crime felt off to Conan. The motive is interesting but underdeveloped. This chapter in the lives of Conan (Shinichi) and Rachel has convinced me that their problem is eventually going to be resolved with a cop-out like "I-Knew-It-All-Along" explanation, which will probably also be offered to account for her stubbornly sticking to Shinichi's side – in spite of being separated for nearly two years. This is the only plot strand that began to bother me more and more as the series went on. The final chapters set-up a story that will be concluded in the next volume and therefore won't discuss it here. On a whole, this was another good bundle of stories, from one of the most prolific writers of neo-orthodox detective fiction alive today, whose imagination has all the qualities of an inexhaustible well – continuously pulling up buckets of these stories from its depths. Although, considering the ongoing success of the series, it’s more a roaring wall of water coming your way. If only more readers over here would allow themselves to be swept away by it. 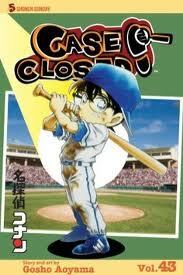 I hope the English translations will be continued so all Case Closed stories are published. The Swedish publishers were far in front of the English translations, but unfortunately they discontinued their publication with volume 63 (because of low publishing numbers), so I'm jonesing a bit for the continuation. Ummm... It's been less then a year since the comic started in their time. Ran's 16th birthday hasn't even happen yet. "Shine on this life that's burnin' out"